With the gay marriage debate being a hot topic of conversation in the news, there are a lot of opinions being thrown around. Personally, I think people should be able to whatever makes them happy and no one, not even Kim Davis, should be able to stop them. I also think that is interesting, in light of all this conversation about the legalities and morality about gay marriage, there is new research that suggests that homophobia is linked to many other psychological issues. The study, which was conducted by lead researcher Emmanuele Jannini at the University of Rome Tor Vergata, suggests that homophobic people typically have other psychological issues. 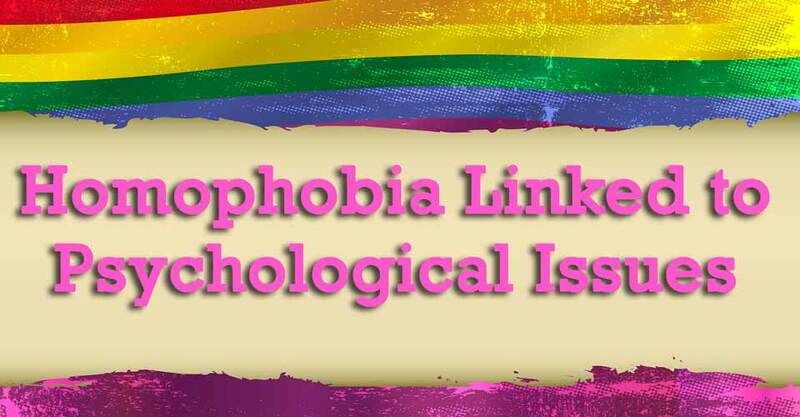 The study involved asking 551 Italian university students from ages 18 to 30 to fill out a questionnaire about the levels of homophobia, as well as their levels of depression, anxiety, and psychoticism. The question were based on a 5 point scale and included statements like:”Gay people make me nervous”, “I think homosexual people should not work with children”, “I tease and make jokes about gay people”, and “It does not matter to me whether my friends are gay or straight.” The questionnaire also asked details about the student’s particular attachment style and whether it was secure or insecure. There were also questions about the person’s coping strategies. What the researchers found was that the people that scored the highest on the homophobia questions also scored the highest for the traits of psychoticism. Psychoticism is actually a personality trait that is defined by hostility, anger, and aggression toward others. They were also found to typically have “fearful-avoidant” attachment styles and immature defense mechanisms. The better someone scored on the other psychological aspects of the test scored the lowest in the questions regarding homophobia. According to Jannini, “The study is opening a new research avenue, where the real disease to study is homophobia.” It seems that homophobia is truly a deeper condition that simply being judgemental on a religious or moral foundation.